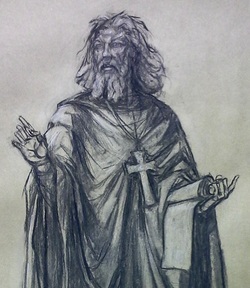 Saint Patrick, 2014, charcoal drawing. We are very honored to be working with Saint Patrick Catholic Church. We are producing two life-sized sculptures depicting Saint Patrick and the Blessed Mary. Also in the construction is a Corpus, which is planned to be displayed in the chapel.